Host Your Golf Outing at CRGC! 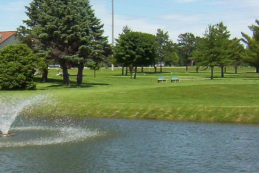 Cedar River Golf Course is the perfect location to host your golf or event. Manager and tournament director Becky Miller is excited to help you plan a golf outing for a group of any size or experience level. Whether you are hosting a family outing, class reunion, charity event or a large corporate outing, Cedar River can accommodate all types of events. Come and enjoy a great day of golf on an outstanding course. Becky and the rest of the CRGC staff are prepared to help you coordinate all aspects of your golf event. Your group can warm up on our driving range and we'll make sure to have as many golf carts as you need. Depending on the day and size of your group, we'll determine whether a shotgun start or tee-times best fits your needs. We can arrange for drinks and snacks on the course, longest drive or closest to the pin hole events, and even help with your tournament format or scoring. Your group can also enjoy the use of our beautiful, remodeled clubhouse. Hang out and enjoy a drink at our bar or on our patio, or let us provide food for your event. Whether you are looking for sandwiches at the turn or steak dinners, we're here to make your event all you expect it to be.